"For those days when you only have a little bit of time and patience to cook, this recipe will fulfill your needs. 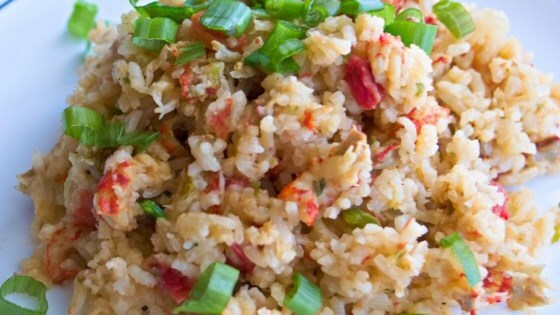 It combines crawfish, spicy diced tomatoes, and rice for a quick and delicious meal. Serve with garlic bread on side. YUMMY!" In a large bowl, combine rice, green pepper, onion, green onions, crawfish tails, chicken broth, diced tomatoes, margarine, parsley, and Cajun seasoning. Pour into rice cooker, and cook for 1 cycle, or until liquid is absorbed, about 30 minutes. Taste, and adjust seasonings. This is very good and quick and easy will be making this again very soon!! We're from New Orleans and we love this recipe! It is so quick and easy! I think it needed more Cajun seasoning and I had to add more broth because when it was done it was still a bit crunchy. Used shrimp. I will make it again with 50% more seasoning.